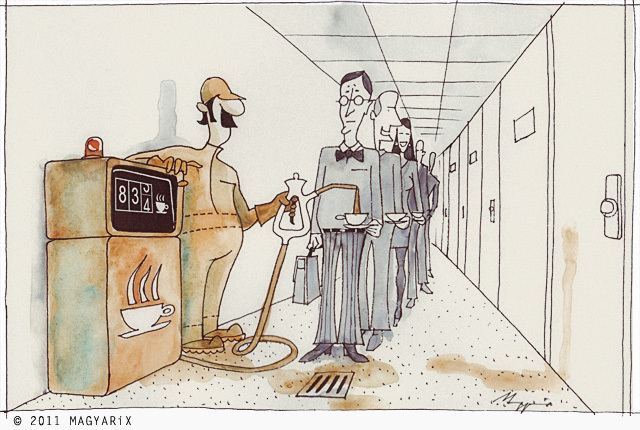 New Coffuel (coffee fuel) stations at large office buildings can not only control the coffee consumption (health status of the employees) but create new jobs. Award-winning design and well-qualified, friendly staff is awaiting you 24 hours a day. All Coffuel points support a very natural socialization of all colleagues. It's funny:) I like this!! This is great! Love the perspective and the old-fashioned style. Excellent ! Love the coffee mark on the opposite door ! Doesn't the Guy stand inside the machine nowadays? Love that drain and the coffee stain on wall! Very clever! I love the style. This is a wonderful one!